Planning on hosting a children's Halloween party? 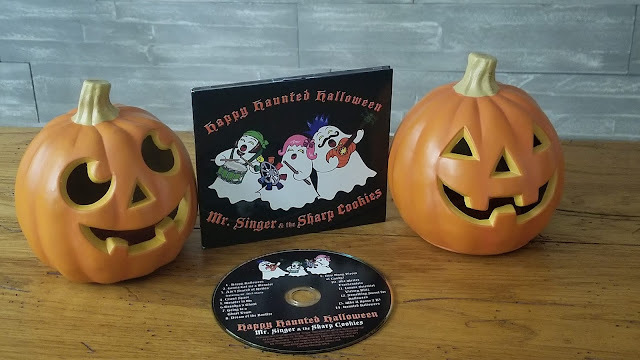 HAPPY HAUNTED HALLOWEEN the newest album from the kindie rock band Mr. Singer & the Sharp Cookies would make a perfect soundtrack for the festivities. The fourth album from this Chicago-based musical group, Happy Haunted Halloween provides a spooky good time with songs aimed to entertain the little ghosts and goblins in our lives. With plenty of treats and maybe a few tricks up its sleeve, this family friendly album offers something for everyone who loves Halloween: spooky songs about haunted houses, ghost towns, crawl spaces, and monster hunters; sweet songs about gathering with friends, dressing up as a cuddly bunny, and counting trick or treat loot; and even an historical song about the brilliant teenage author, Mary Shelley, plus a dance number inspired by her novel Frankenstein. Happy Haunted Halloween features a variety of musical tones. It kicks off with "Happy Halloween," an upbeat dance number about the excitement kids feel before going trick-or-treating. "Ain't Scared of Nuthin'" is a little bit of Halloween bravado and some "I'm not so sure about this!" set to a Bill Haley-type boogie-woogie, featuring guest artist Mr. Nick Davio. "Grandpa's Ghost," is a country tune about a grandpa whose life is saved by the harmonica in his pocket. "Dream of the Bonfire," is a melodious ode to bonfire celebrations which overflows with sentiment about spending Halloween with friends. These are just a handful of the musical stylings that are within this 14-song album. Happy Haunted Halloween is available at all digital retailers, including iTunes, Amazon, Google Play, CDBaby, and more. The band also has compact discs that can be purchased at their live performances. Mr. Singer & the Sharp Cookies also provided ageekdaddy.com with a CD of Happy Haunted Halloween to giveaway. One lucky winner will receive a CD of Happy Haunted Halloween. For a chance to win, simply follow @Geekdad248 on Twitter and retweet the original giveaway post embedded below by 11:59 pm on Sunday, October 14, 2018. Must be a United States resident over 18 years old to be eligible to win. 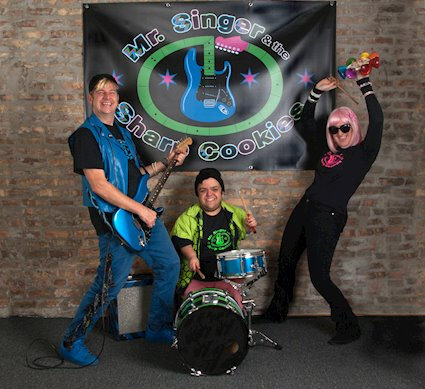 Mr. Singer & the Sharp Cookies' publicist will mail the prize to the randomly selected winner. Good luck!